The GummiArm is a novel robotic arm which can vary its passive compliance (or softness) through its agonist-antagonist actuator-tendon configuration. That is, with the ability to co-contract muscles to increase joint stiffness. A bit like you and I, in other words. This means that it can afford exotic behaviours such as shock absorption, energy storage during motion (throwing), stiffness variation in real-time, and more. 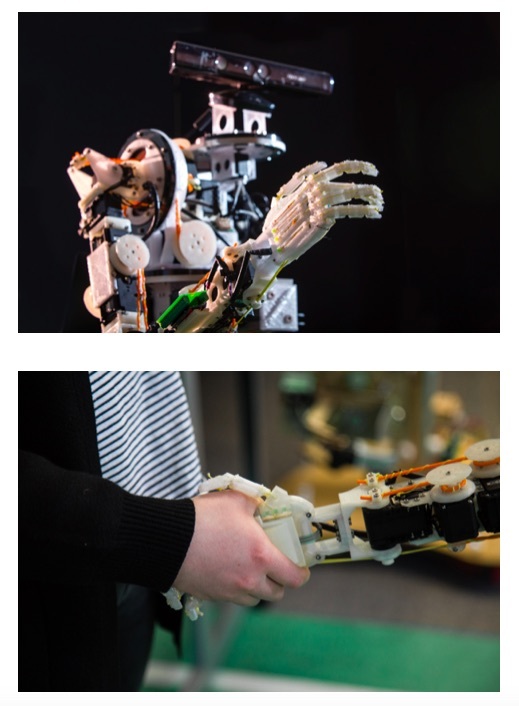 Such features seem key to enable robots to co-exist and co-operate with people on the one hand, and to get closer to the human levels of manipulation, on the other hand, (Vanderborght et al., 2013). The technology also makes the GummiArm robust to unpredicted or unpredictable perturbations, while affording adaptability and accuracy when needed. More details on these features can be found in (Stoelen et al., 2016).